Hi, I just checked HOTH PRESS, the press release and distribution service you provide. I wanted to know if you provide a review of the PR before it is submitted for distribution? Yes we do provide a review before it goes to distribution – you need to select the option with review though. It’s up to you – you can order follow or nofollow. We just recommend that you don’t use follow links with your main kws. We recommend just going all naked or brand links. Just clarifying on this topic. My understanding is that when news outlets pickup releases they always nofollow the links. That’s how it works with prweb, etc. 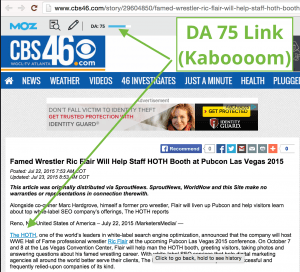 Do you have something else going on here that does generate dofollow links on high DA sites? @hitechlandlord – I’m actually curious about this as well… If I don’t check off the hoths’ recommend “no follow”, is there a possibility that some do-follow links will generate?… confused. Great advice for avoiding – or QUICKLY correcting imbalanced ratios. There’s nothing like broad and deep PR syndication to achieve that in the current SEO climate. Spun author resource boxes used to help, but unlike press releases — there’s only a dozen article directories worth even using these days. How much does the press release cost? Hi hothadmin, can these press release work on a Job site? If so, how should we order for you guys to start working on it as soon as possible. We want something natural and the way you have explained, its seems to be a safe way to start link building. A press release can be used on pretty much any site, regardless of niche, for the reasons above. Can I use your press release service for a UK based business, or will it look a bit suspect to Google for a UK business to be getting loads of US based news links? Yes. The press release isn’t US specific – we distribute to international channels like Associate Press (worldwide). What kind of guest post can an amazon niche site go for? Not sure I understand your question, could you clarify? For example, if an amazon niche site only writes about product review articles or informational articles (nothing “new in the industry”), what kind of press release article suits a niche site like that? I know there are many small niche site owners who use The Hoth and I’m wondering if press release works for them. @Hothadmin – I second this question by Denny, shine down some Hoth wisdom pls. Great article by the way! I think in short; this is getting at what exactly is press-worthy content”? Ya know are we just paying for our date’s meal here or are we trying to get to 3rd base? I’m assuming the press release content itself promotes whatever value it is that the website provides. So, would the correct approach by an affiliate marketer be, “hello press world, here’s another website with reviews, best of’s, and how-to’s, latch on” – and maybe it’ll lead to some high DA backlinks, or should there be more emphasis placed on the quality of the content in the press release itself, such as an infographic or something. Does that make sense? Great strategy on getting brand and naked links out there to avoid getting Penguined, keep up the SEO clubbing! Thank you! Hey thanks for such a great post. Yes, you can use it for any sort of event. You would want to also post it to your facebook, send it to your email list, etc once the article is written to help target your audience. Press releases are usually ~500 words or so. Are the press releases SPUN or do you distribute the same content? Press releases are not spun – Duplicate content is only an issue if you have it on sites you’re trying to rank. In this case, we aren’t trying to rank these press releases. so is it just that we have to use naked url and brand name to avoid penalty? also what if the domain has the main keyword , can we still use a brand name? Yep, you’ll want to use a bunch of naked anchors, benign anchors, etc. Lots of diversity. If the domain name is a commercial anchor text or the exact match (like cheapshoes.com), then you’ll want to have more benign or naked URLs to stay safe. Any pointers on angles to suggest for Press Releases? Also based on Hoth Press, it says you send it out to about 30,000 journalists. About how many get published on average? This seems great. We cater to a specific sector that searches out news. It would be nice to test this for a few months to see if we would benefit from it. Thank you. Yes, you can use a press release at anytime. I am wondering about how a local landscaping company can create a reason to have a press release? Nothing I can think of at the moment, but sure would be nice to have something newsworthy to justify a press release that doesn’t just look like a link-building tactic. …if all else fails, plan to do something newsworthy! Apply for awards, create an event, release a new service, etc. For an established site how many would you recommend per year or per month for maximum benefit? The Hoth press release pricing is actually very good. Some press release services can go for $300 or more for basically the same thing. I help run several golf-related websites including websites for golf courses (including wedding banquets) and press releases along with other SEO strategies can really help boost your rankings – assuming that you actually have valuable content on your site. Great post and I would highly recommend. Used this service at the start of my site and saw an immediate spike. Well done The Hoth. I would love to use your press releases for my upcoming Apps project launch and development service for the community. Please can a press release have a video of the launching event embedded in the 500 words article? Not at the moment, but you can link to the video. What a post! But clarify me, would press release usefull for amazon niche sites? Yes you can use them on Amazon niche sites. 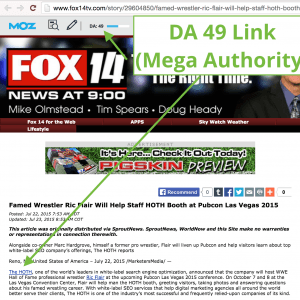 What is the benefit of nofollow links? My understanding of the value of a backlink is to pass link juice to my site. Greater link juice should give my site higher rankings as well as greater domain authority. By definition, a nofollow link tells Google not to follow the link to my site. All natural link building profiles have some amount of no-follow, so I wouldn’t worry too much. Having a mix is the best bet. Thanks. I read the post end to end and also the comment. However one question before ordering: at the hoth it costs 149$ but else where it may cost less or more, may you tell me what are the main different the hoth gives? This blog looks great. In my opinion, THEHOTH press release service is extremely great and worh for its value paid. In fact, I enjoyed this service from thehoth and it helped me to take my site to higher. I enjoyed hothing with press release service. Can you please clarify this one? Yes – Basically when you start a link building campaign it’s a good idea to build a base layer of links before getting into exact match anchors. Nice! Just wondering: What topic or headline would a local business release a press release for? What do you usually write the press release about? New service launch, new employees, new service area, awards & recognitions… The possibilities are endless! Whats your turn around and do i need to create my own content or is it something you do for me? Our turnaround is usually 1-3 weeks depending on volume. We will write the content for you based on some inputs you provide. I agree with you that Press Releases is definitely an SEO service to counteract with Penguin Penalty by Google. Every niche site owner at some stage of their niche journey should use at least one high quality press release, preferably at the beginning of the site published. This naturalize the link building process. I personally recommend to use great press release service from THEHOTH. In your experience, how long do the links last? Aren’t most PR links deleted after a few months? Hi Tim, in our experience links aren’t deleted from press releases – they stay active unless you use a PR provider that eventually deletes them – good ones don’t however. That being said you do want to time your press releases somewhat because they get the most eyeballs on them when they’re initially released and pickup up by other news outlets. I have already used a press release company to do just that, and found two backlinks afterwards. Is this considered normal, or should I hope for more when I use you? It has been brought to my attention that syndication services/news sites do not accept press releases that promote or link to plastic surgery, cosmetic procedures, body modification, weight loss and other related topics. Is this correct? Would this cause penalties if I did this sort of press release for a client? I don’t know that it would cause penalties, but in general, a press release that is more promotional in tone (sounds “sponsored” as opposed to news of an event) will be less widely picked up by editors. These news sites generally want to post content that tells about something new, so if it reads like an advertorial press release it won’t be as widely accepted. It’s best to strike a balance and emphasize how the entity being promoted is improving by offering those services/products rather than make the release all about those products/services themselves. Is this service recommend just for US-based company? Or can a Norwegian company do this with the same results as a American firm? A press release is recommended if you think you can use it to get the attention of journalists. The best tactic for you might be to try a press release and then submit it to Norwegian journalists / Norwegian sites who might be interested in picking up the story. I’m really new to this seo stuff..
What are follow or nofollow links all about??? When you link to another website, or another website links to you, search engines will see that link. A Nofollow link instructs search engines not to pass along any of the “power” a link provides to where it’s linking to. 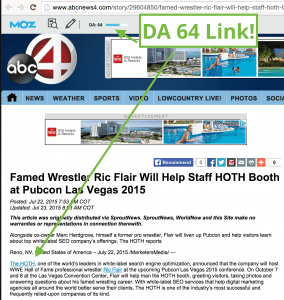 A Dofollow link does instruct search engines to pass along some “link juice” to the site it’s linking to. I would think of nofollow links as for use by humans only, and dofollow links for humans and search engines to see.